Aren't we all rushed these days? There never seems to be enough time to make all the wonderful pieces that you dream of. Well, that's one of the things that I most like about the 30-Minute series by Lark Books. 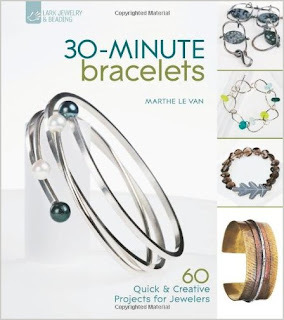 I've previously posted reviews of 30-Minute Rings and 30-Minute Necklaces from the series, and now I've had the chance to read through 30-Minute Earrings and the new 30-Minute Bracelets too! I haven't changed my mind...I think this series is wonderful. Flip through for some quick inspiration from some of the best designers out there, or browse slowly to enjoy the sights. The books are all heavy on fabrication, but there are also wired, strung, stitched, and beaded projects as well. 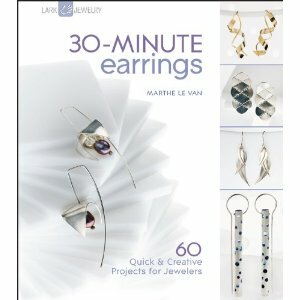 I'll remind you again that these are not really beginner books...many of the basics are assumed rather than spelled out, and there is no included techniques section, simply a list of tools that you'll need. But since many of us already have books that cover the basics, I don't consider that a failing, just something to be aware of when you purchase them.